WINTRY VEGETABLE BEEF SOUP ....cuz baby it's COLD. OUT. SIIIIIIIIDE! Well, it's official. It's FREEEEEEZING outside. The cold and the snow decided to takes their sweet time this year...and then slap us in the face. Hard and fast. Just last week it was a sorta pleasant 48°. Now it is a very unpleasant 5° (-7° w/ wind chill). Sure, snow's pretty...but ice and slick roads with black ice...not so pretty. I actually like being enveloped in that big white hush. As long as I can stay home all cozy and warm and see it through my window. But the minute you have to send kids out to stand at the bus stop worrying the whole time whether or not they'll make it home with all of their fingers and toes, it ceases being pleasant. Oh, or the minute you have to get on the road with all of the morons who forgot in the last 8 or so months how to drive in the snow. Um, hello...we live in Northern Indiana. It snows every year. I wouldn't mind driving so much if there was NOBODY else on the roads. Never seem to get that lucky, though. But, imagine if you will a day where you're tucked inside the house and only know it's snot-freezing outdoors by the icicles you can see hanging from the barren trees through your window. Nobody has to leave...music is playing...blankets are strewn from every available chair, table and shelf to form a massive fort...and of course, the kitchen is beckoning! This is when I don't mind it so much. A big pot of soup...bubbling on the stove...that's the stuff baby. That's the stuff. Begin by melting the butter with the oil in a large Dutch oven. Brown your beef well on all sides. Once all sides are browned, drain off any excess fat in pan (more than a tsp.) and add 1 qt. of stock to pot. Bring to boil, then reduce to simmer. Cover pan and simmer gently for until meat is fork tender, ~2 1/2 hours. 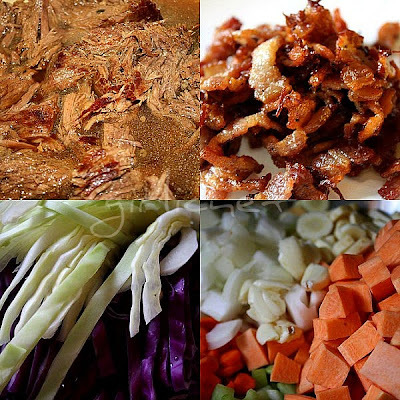 When beef is finished, transfer it to a large bowl with any juices and let cool until able to handle, then shred it. In the same pot you cooked the beef in, add the bacon and cook just done. Remove bacon, but leave fat in pan. Add veggies and cook until just beginning to soften. Add shredded beef and reserved bacon back to pot along with herbs. Add 2 qts. stock (or more to just cover) and simmer over medium-low heat until vegetables are tender, ~10 minutes or so. I let it sit, covered for at least an hour to allow the flavors to come together. Remove herb stems and bay leaves. Season with freshly cracked black pepper (and salt if needed, depends on the saltiness of the liquid you used, so taste first). To serve, drizzle with a glug of balsamic vinegar and grate some fresh Parmesan over the top. Sprinkle with fresh, chopped herbs and more black pepper, if desired.There. Nice and cozy. Indoors with a big, bowl of steaming soup. Can you see the ice on the window pain melting from the heat in the kitchen? I can. *I am entering this recipe into the FOODISTA Cookbook entry "contest" (read about it at the top of my sidebar) and would love it if you could go rate it (click on stars) if you get a moment. And everybody is free to enter an original recipe for a chance to be in the upcoming cookbook...so what're you waiting for!? This recipe was chosen to appear in the Foodista Best of Food Blogs Cookbook which comes out today! Thanks so much to everybody who voted for me and made this possible! It is ridiculously cold here too! Only 0 degrees :-/ I posted a soup this week too, tis the season! :) This looks GREAT! I LOVE this type of soup! And a big pot like this lets you have time for baking. It's 13 degrees here- don't want to know the wind chill- but at least there's no ice or snow. At 7 am it was -7 here and now it's a balmy -4...LOL! Gorgeous sunny day though and I'm finishing up my Christmas Shopping today! HEY! Wonderful looking soup and so appropriate for a very cold winter day! The cold has hit us too, howling winds, snow, ice, the whole bit. Us puppies are NOT happy! The soup/stew is perfect for this time of year though! Delish. It was -9 yesterday morning and only got up to 9 degrees total. I'm feeling ya! Soup (yours) looks wonderful. Heh, we had the same thing. It was 60 one day and 25 the next. Ah New England. Mouth watering photos. It is definitely soup weather and this is perfect! We have snow and minus 4 degrees. We won't speak of windchill. I would love a big bowl now! Man, it is -15C here this morning! I could have this soup for breakfast!!! Freezing right along with you! This soup looks like just the thing to keep me less-than-frozen this Winter! Wintery vegetable beef soup - now that's mind kind of comfort food. Stay warm and enjoy your awards. I've been rating your recipes on Foodista with as many stars as they show. Good luck, but of course we know you don't need any luck with it comes to great recipes. What a perfect soup for a damp and blustery day. It's soup weather all the way!!! Mmmm...looks really hearty and, of course, delish! I wish it would snow here, just so I can snowboard to the market. lol. Yum yum yum! This soup looks perfect for winter. I love that you put in parsnips. They are one of my favorite vegetables. I'm also totally with you about the snow driving. I swear people are dumb. I live in New York and it snows and yet there are two types of people. The type who go so slow I want to scream or the people who go 100mph and drive like jerks. It's pretty cold here in Kentucky too but without snow. Your soup is perfect for warming us up! Thanks for sharing and keep warm!! It's not quite that cold in NY, but I'd still welcome a big bowl of that yummy looking soup. I agree with you about the morons on the road, especially the ones who are texting and talking on the phone as they speed and cut others off. I love all of my vegetarian food to have meat in it and this fits the bill! oh and I never figured out the link thing for bloggeraid - can you send me that - remember I am a little HTML challenged. Bacon. That's what my beef vegetable soup needs. There are so many great things in this recipe. Can't wait to try it! Cold here to! But wow, that soup would warm anybody up, AWESOME! It's like spring in HK these two days, I miss winter!! I would LOVE to come home to a soup like this after negative degree temperatures. It could de-frostbite my fingers. And warm my belly. At the same time. I don't know WHAT is wrong with drivers these days. The world is just full of bad ones. Bacon in soup? YUM! I never thought about doing that...WHAT is wrong with me? duh!! total double yum! I love the variety of veggies in this soup! 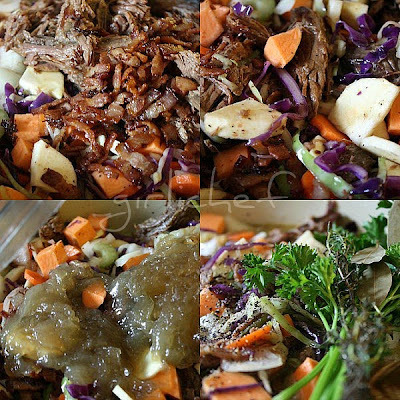 Vegetable beef is one of my favorites, and makes the best leftovers. Sounds perfect for a cozy day inside! this looks so good! i love a chunky delicious soup to keep me warm! Thank goodness I live in Florida :-) I am not sure I could manage very well in temperatures in the single digits-YIKES! I sure as heck would be one of the not so good drivers in snow. However, I feel the same way about people here when it rains. Suddenly, they can't drive and it rains all the time! Your vegetable soup looks warm and comforting. After a freezing day, this soup is perfect. You set such a cozy little scene! I'd love to cozy up to some of this amazing stew. So warming and comforting! Northern Indiana…my son’s girlfriend lives in Hobart . Is that close to you? And the soup – fantastic. Love love love soup! A perfect soup for the cold weather! I love the combination of the ingredients here! Gorgeous soup! I'd eat it here even though it isn't freezing! Thanks for sending it to Souper Sundays! It's -15C here with the windchill. Blech! That soup is perfect to ward off the chill. I love your description of staying inside with blankets and music. Great post. I love this type of soup and love putting it in the crockpot to simmer all day. I'm making this tonight. Hope you are staying warm and toasty. Your soup looks wonderful. I miss your weather sometimes, but not for long. This looks perfect for tonight! We are supposed to have freezing rain. ICKY! I would say this sounds perfect for any day! No snow here, actually it was 65 here yesterday. It is supposed to rain all weekend, it may be the perfect time to make your lovely soup! The soup looks perfect for a snowday. I oh so agree with you about winter... I loved the snow when everyone was home and cozy and I cooked and baked to my hearts content... but send me out in that niserable stuff... yuck! OMG! It is totally freezing outside, and I want a soup just like this one to keep me warm! I love the big chunks of veggies and meat you put in this soup. It looks great! How perfect! I love the way you cooked the meat in the beginning - that must have added so much flavour! Girli, this would defrost anything on me that might have inadvertently been frozen, hahahahahah!!!!!! It has been bone chilling cold and extremely windy here, making it even colder. This is a great hearty soup with lots of pretty colors! This looks so good! What a nice hearty winter soup. I could really picture how wonderful it must feel to be inside all comfy and cozy with a big blow of that soup watching the snow outside your windows - doesn't get much better than that! Oh by gosh by golly, your soup looks awesome! No snow in NY, yet! snowing outside, warm and cozy inside, soothing music and a pot of soup. Yes, that sounds ideal. What a flavorful and hearty soup - yum! Bad drivers in the snow drive me crazy too. I agree about the snow...it's pretty and I enjoy looking at...but having to go out in it is a whole different thing! This gorgeous soup is the perfect way to warm up! And girl...that stew looks beyond appetizing. My mouth is watering just looking at those itty-bitty pictures! And yes...I shall vote for you! Yay! I could totally do with a bowl of this soup right now! Hearty, warming and delicious! I love vegetable soup but yours looks so delicious. My hands are cold from the weather. A bowl of that would heat them right up. I have been voting for you but are there any that others could put up for you (on our blogs). It would sound silly to post, "Vote for me." Silly me. Of course I can post the widgets. I have two of my favorites up and I will look again tomorrow. Now, I must get some sleep. Patting myself on back. You deserve to get in there. You cook up a storm and your presentation can't be beat. You are goooood!